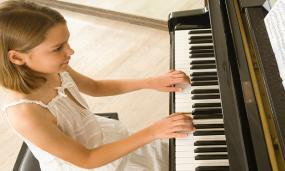 Marin Piano Studio's unique, classically-based approach to piano lessons makes learning piano fun! Students enroll in weekly lessons, use cutting-edge technology, and learn by playing games - all of which get students progressing quickly through their books! 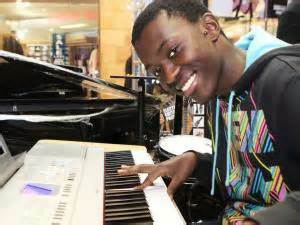 Students benefit from the exclusive, full-service approach to piano lessons, receiving extensive support - not only during the lesson, but also through optional Video Call Lessons. Additionally, the instructor is always available if a student has a question about a piece. Please read on to discover what sets Marin Piano Studio apart. What is Unique about Marin Piano Studio? Along with weekly lessons, students may request an additional, free lesson each week - by FaceTime or Skype. Students love making quick progress through their books & are excited to come to lessons because they are well-prepared! Games and technology are incorporated into lessons, making learning fun and helping reinforce, deepen, and broaden students' understanding of musical concepts. A student working on his composition in GarageBand. Just one of many videos students use during Music Lab. Younger students may stay an additional half-hour for Music Lab to compose their own music, study and complete their work on our Composer of the Month program, learn music history, engage in listening assignments, and utilize the many music theory programs on the computer to reinforce concepts taught in the lesson. 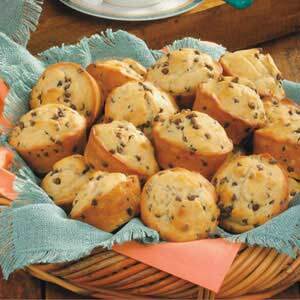 Before lessons, students may enjoy a complimentary selection of fresh snacks. Frequent and fun Piano Parties for Children and Studio Get Togethers for older students are given throughout the year, at no additional charge. We learn about music history, ear training, and perform for each other! Students look forward to and love these great community-building events at the Studio! Aiden promoting to his next books after only a few months! Way to go, Aiden! Students at Marin Piano Studio move quickly through their books, and feel great about the progress they make. The pieces that students learn are accessible, fun, and make each student feel successful. Younger students love our fun incentive programs incorporated into the lesson program. 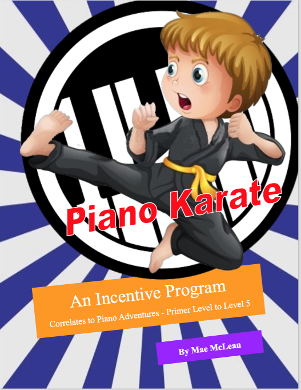 Get rewards for mastering skills with our own, original, Piano Karate Program. From earning prizes, to earning the next belt color, to earning a ticket to our annual ice cream party, students will, literally, be begging to practice! Students at Marin Piano Studio are given a firsthand experience of music, both creatively and interpretively. They learn not only how to express themselves through artistic performances of various styles of music, but also how to make their own music through improvisation and composition. Students gain a comprehensive musical education through personalized lessons, focusing on repertoire development, theory, ear training, sight reading, music history lessons, improvisation, and composition. All these skills are essential for forming the basis of a well-rounded, knowledgeable musician. Various types of performances are given, from recitals, performances at care homes, as well as performing for peers during frequent studio classes.